Alpha Gold Moist Muesli is a complete and balanced diet that is ideal for fussy eaters. This unique blend of the finest cereals, peas, beef chunks and wholesome biscuits is nutritionally formulated to provide a moist crunchy food. The natural glucose glaze creates a highly palatable food which encourages a good appetite in even the fussiest of dogs. Wheat Beef Meat Meal, Flaked Maize, Wheatfeed, Syrup (5.0%), Flaked Peas, Poultry Oil, Poultry Meat Meal,Maize, Maize Gluten Meal, Brewers Yeast, Fish Meal, Soya Oil,Limestone Flour. Amount shown is a guide to the daily amount in grams. 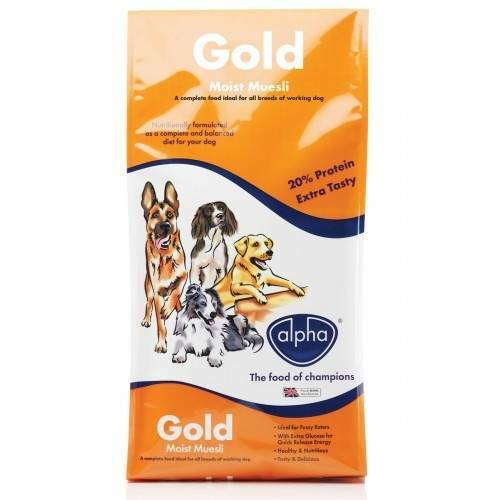 There are currently no questions for Alpha Gold Moist Muesli Dog Food - be the first to ask one!